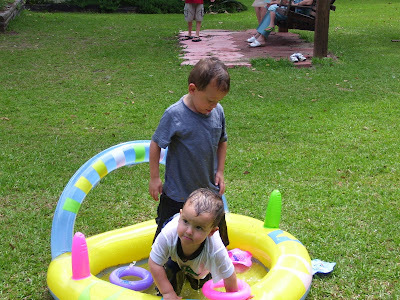 They had no choice–it’s in their genes…boys that “see” water in a pool…no matter the size…must jump in….clothes, shoes and all! Rylan just doesn’t understand why they got in with their shoes on…. Hope you don’t mind me sharing pictures this week. I will be back to regular devotions next week….this week, let’s just share a bit over a cup of coffee…or tall glass of iced tea…sweet please…with lemon! Janice, whatcha fixin’ for the ladies tomorrow night? Aimee said you looked after her while I was away. I knew I could count on you! You are wonderful! Thank you for that! A very special thank you to my sweet precious ladies and sisters-in-Christ from Marianna First….you read, you tell me you are fed–or enjoy it—it lifts my sometimes weary heart! It meant a lot on Sunday to hear those words. Thank you dear ones. 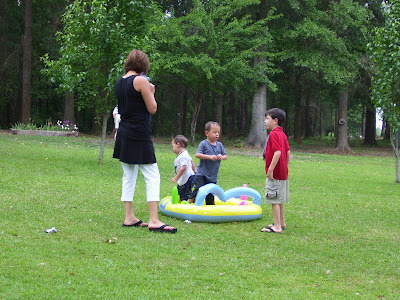 This entry was posted on Monday, May 12th, 2008 at 10:20 pm	and posted in Family, Fun. You can follow any responses to this entry through the RSS 2.0 feed. « The Cabbage Patch Hospital and Helen, Georgia Trip! Share all the picture you want to my dear friend, I love them. Oh what cuties!! Wet and fun cuties! I love these pictures and the commentary that goes with them…oh my they are darlings. Love ’em!